Noah Markowicz (Dr. Dreidel) and I are doing a new night at Korova on Tuesdays. The concept is music before 1986, hence <86. Come down to Korova Bar (3908 St. Laurent) and check it out. Rotating guests, free mix-tapes! I was on a casual stroll down Van Horne avenue earlier this afternoon, on the hunt for a coffee, when I came across a giant Saint Bernard tied to a telephone pole outside of a grocery store. This Saint Bernard was at least the size of a pony, and therefore, I would imagine as ride-able as a pony. ("Can I ride a dog?," I thought. "Can I ride that dog?") It struck me that if one could somehow combined the ride-ability of the pony or horse with the love-ability and trustworthiness of the dog, well then, that ambitious breeder or marketer or trainer or what not would really have something. A dog-pony. A dog you can ride. Dogs you can ride. Ride-able dogs. Man's best friend, and man's best ride. Equestrianism has a whiff of hide-bound tradition and the static class society, not suitable for the democratic ethos of The New World, but dog-riding has the potential to be an accessible and affordable form of animal riding, if only someone were to step up and fulfill the need! The riding animal or mount animal has been a part of civilization since the, er, dawn of civilization, and possibly before - from the Hindu & Buddhist Garuda (or Garula): a winged mythological creature; to ostriches, dromedaries, and elephants. 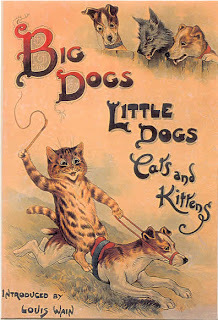 This sadistic little book cover above is, of course, nothing like what I was imagining in my head, and the image of a maniacal, wild-eyed cat driving a poor hound into the ground by the handle of his switch belongs to a different time, when peace between species was not so close at hand, as it is now, in the year 2008. 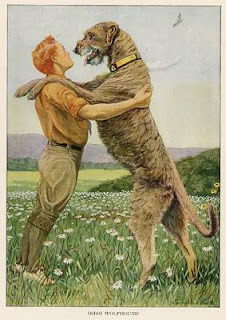 For years, clueless Irish Wolfhound owners* have done nothing but stand their Irish Wolfhounds on their hind legs to pose for illustrations, paintings or photographs, trying to prove some inane point about their dog's size, unaware of how much more impressive it would be to come trotting down main street astride their majestic beast. And for the Irish Wolf Hound? No more demeaning parlour tricks, no, the Irish Wolf Hound could hold head high, becoming part of a lineage that includes the mighty stallion and the regal elephant. Do any of you know of any dogs that might be suitable for riding? Interested breeders, please get in touch. Can you ride a dog? Have you rode a dog before? Are you interested in buying a dog saddle? I can and will ride a dog. I swear this now. Certain larger canines (Newfoundlanders, Dog of Berdoux, Bull Mastiffs) have been fitted with saddles like majestic mini-horses for the infirm, very young children, and certain elderly people with very frail bones to ride. * A special thank you to Marion Elissalde, a dog-owner but not dog-rider, for suggesting Wolf Hounds.